Have you seen my Infinity Sweater out in the wild yet? Heather made herself one. Jodi made one, too, a little shorter for a different look. Sara was the first to whip one up. Have you made one? I would love to see it! I’ve had some requests to see more views of the Infinity Sweater worn different ways. Here are a couple collages put together by Janna of LilacPOP wearing her sweater and mine. This pattern is exclusively available in the Sew Fab Bundle right now. There’s no minute like the last minute, so pick yours up before 8 am on 10/8/2013. Sew Fab e-pattern Sale Event! Last February was the first ever Sew Fab e-pattern Sale and it was so successful and was so well received that Jenny Yarbrough of The Southern Institute, the creator and administrator of the sale, decided to have more! This sale is bigger and better than the first, with plenty of patterns to get you through the fall and winter (if you live on this side of the hemisphere), and a few warm weather patterns thrown in for those of you who live on the other side of the world. 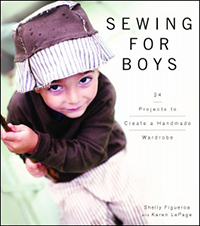 You’ll also find more gender neutral patterns for those of you who are sewing for boys. And what about you? Of course there are a few women’s patterns thrown in for some selfish sewing too! Over the past several weeks a lot of behind the scenes planning has taken place to bring you this newest bundle of ePatterns from many of the top established and up and coming online sewing pattern designers. The result is a bundle of 26 PDF sewing patterns that you’re going to love! For one week only, twenty-six pattern designers have come together to bring you 26 of their best PDF patterns, valued together at well over $2oo.oo, for the incredible price of $29.95!!! That’s over 80% off of the combined retail value! Plus you can enter to win a dream of a giveaway with several prize packages from some of your favorite online fabric shops! For less than $30.00 you will have a library of resources that you can use over and over again. The designers that have joined this sale are experts in their craft. Each designer has contributed one of their favorite patterns to create a bundle that is sure to please! 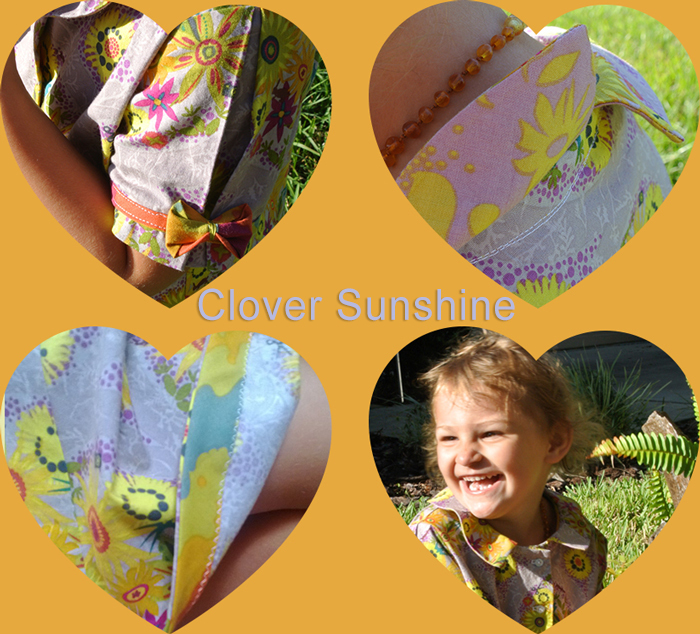 Whether you are sewing for your own family or making gifts for others, these are patterns that you will love to use. If you’ve never sewn with a PDF pattern before, let me tell you how great it is! After downloading your pattern instructions and your pattern, you will print out the pattern itself, creating pattern tiles, if you will. Simply tape the tiles together to create the full pattern! At that point you can cut out the size that you need and pin the paper pattern directly to your fabric, or you can trace the pattern size that you need onto sewing paper or tracing paper and cut it out, saving the paper pattern for later when you need to sew another size. Pdf patterns are so convenient because you can print them out as many times as you need! 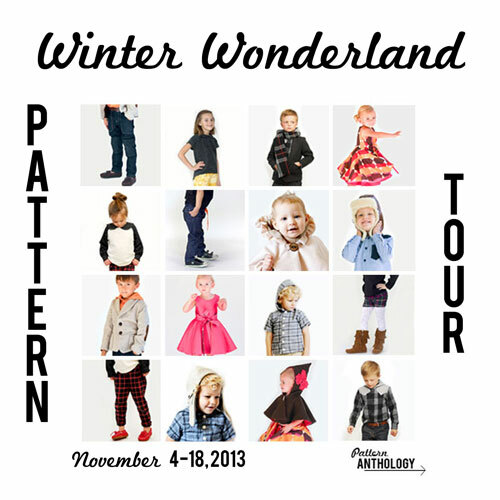 Now for the good stuff… the PATTERNS! This Sew Fab e-Pattern Bundle is only available for one week and will never be available again! You can purchase the bundle from September 30th at 8 a.m. EST through October 8th at 8 a.m. EST and there will be no late sales offered. Due to the nature of the sale there are no refunds. You don’t want to miss this unique opportunity to purchase a ready made collection of 26 PDF sewing patterns from 26 of the best designers out there! And now for The Sew Fab Giveaways! I’m so excited about these giveaways! Can’t buy the pattern bundle? It’s okay… purchase is not required to enter. Each of these prizes will inspire you in your sewing as well as keep you stocked with what you need for your upcoming projects. There are lots of chances to win and each entry applies to all of the giveaway packages. Just use the Rafflecopter widget below the prize descriptions to enter as many times as you want, no purchase necessary. The Fat Quarter Shop was founded in 2003 by Kimberly Jolly who began her shop as a side business, cutting, packing and shipping right out of her house during evenings and weekends. From the very beginning, she was committed to delivering top-notch service for every single order and customer. You’ll still find the same level of service at Fat Quarter Shop, along with an extensive selection of high quality fabrics at great prices. Girl Charlee Fabrics is your retail and wholesale source for unique knits fabrics at the best price. 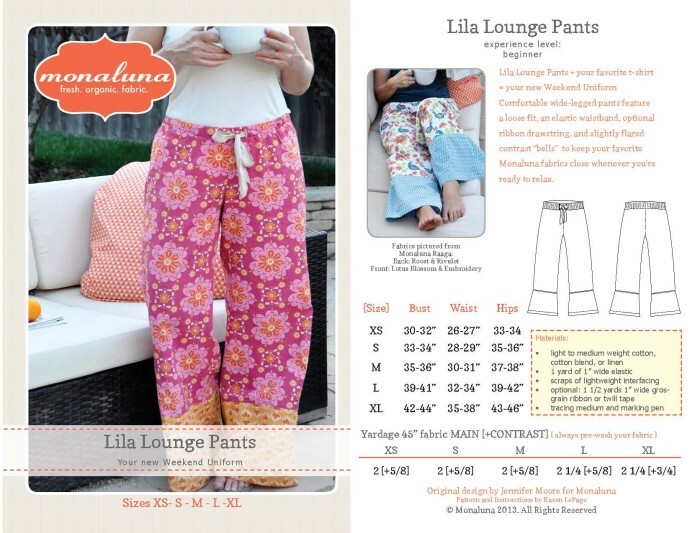 Browse their wide selection of fabrics and specially select knit specific sewing patterns from independent designers. Modern Yardage has a curated team of talented designers who design fabric exclusively for them. They print your fabric on-demand and offer their prints in small, medium, and large scale and as many as 10 different color options. Designs are printed in the standard 44″ width on 58″ wide, pre washed, 100% cotton quilting weight fabric, and they use the 12″ margin to print features about their designers, free projects and patterns for you, and other fun goodies! #4: $50 Gift Card to Michael Levine, Inc. Located in the heart of the Los Angeles garment and fashion district, Michael Levine, Inc. is one of the Largest fabric retailers and wholesalers in the nation. With two retail outlets and a super stocked warehouse, Michael Levine, Inc. is the place to buy fabric. Finch Sewing Studio provides a curated selection of modern fabrics and cool tools. 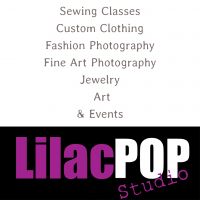 Our classes are offered in our physical shop in Loudoun County, VA. We offer fun, on-trend classes for beginner and experienced sewists alike. We teach the skills and provide the materials to make beautiful, handmade goods. Fabricworm offers a selection of fresh, modern fabrics that you’ll love, including organic fabrics and japanese import fabrics. You’ll find children’s fabrics, fabric bundles, quilt kits, and free sewing patterns when you visit Fabricworm’s shop. Come by and search their great selection today! Sign up for the Sew Fab Newsletter to get the latest Sew Fab News! Winners will be announced in the newsletter as well as upcoming sales and other news pertaining to the Sew Fab Sale and the world of pdf patterns. The Sew Fab e-Pattern Sale! 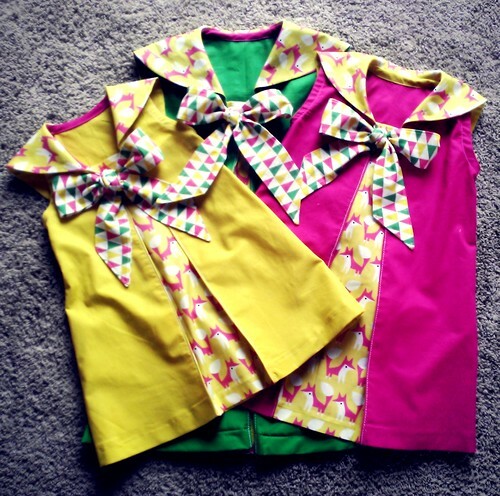 *Patterns included in the Sew Fab Pattern Bundle are intended for personal use only. The selling of patterns without designer’s permission is prohibited and punishable by law. Please contact individual designers for licensing requirements if you desire to create and sell clothing from patterns that have been purchased through this sale. **For answers concerning sale terms and customer service questions, please see the FAQ page. It’s Super-excellent SewFab time Next Week! For one week only, twenty-six pattern designers will be joining together to combine their best PDF sewing patterns (valued together at over $200.00) and selling them to you for the incredible price of $29.95! That’s over 80% off of the combined retail value! 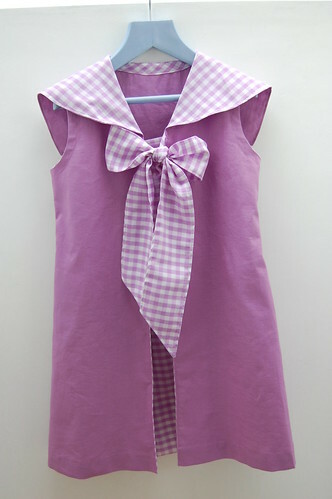 Grab the bundle when it goes on sale next week and you’ll be all set to sew for school and the coming holiday season! You’ll have to wait until next week to see which patterns are included in this fall’s bundle, but I can tell you right now that you won’t be disappointed! See you bright and early on Monday morning! I’m teaching a class at Pink Castle Fabrics in October and I’d love for you to join me! If you live in the Ann Arbor area, head on over to the Pink Castle web site now and reserve your spot! The class takes place on Thursday, October 17, 2013 from 6:00 pm to 10:00 pm at Pink Castle Fabrics in Ann Arbor (find directions here). The cost of the class is $65. The only prerequisite for this course is that you are comfortable sewing a straight stitch on your sewing machine. It’s as easy as that! 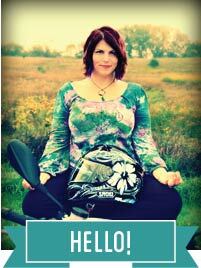 I hope to see you at the class! Kirsten from Life and the New Normal is the winner! Now you just have to pick, and send me an email with your answer – Turquoise or Chartreuse?? I’m a feathers fan, in chartreuse or turquoise…always chartreuse or turquoise. If you didn’t win this time, don’t despair! 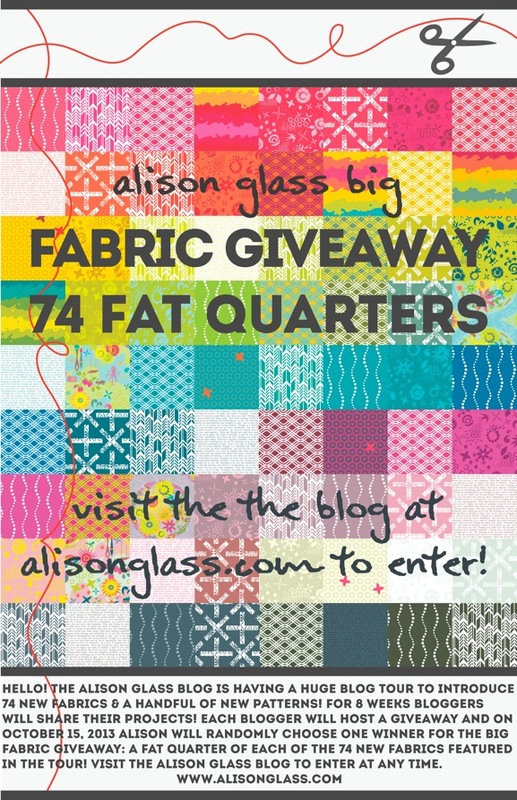 Alison still has a huge giveaway going on over on her blog and you can still enter. Or you can do like I do, and buy your Alison Glass fabrics from Pink Castle in Ann Arbor, MI or your local quilt shop. When I saw Alison Glass carrying around her newest swatches at Spring Quilt Market in Portland, I was tempted to make off with her Circle Print from Clover Sunshine while she wasn’t looking. Since I know the lovely Alison personally, I simply asked for a little fabric to help her show the world her newest line. 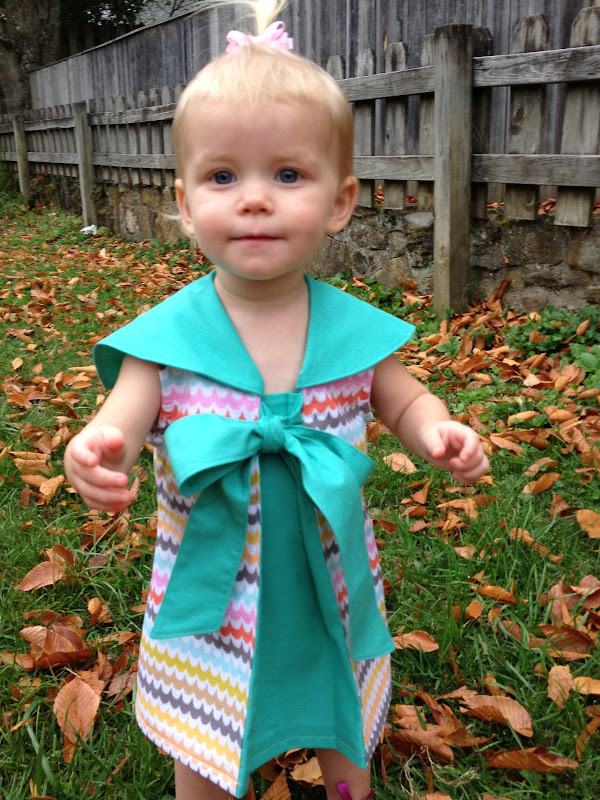 It’s so cheerful and beautiful, I knew I needed to make my little niece a Bonnie Dress (coming from me in Spring 2014). I usually use a ribbon to cinch these princess sleeves, but the Kite Tail print is begging to be a bit of a star so I made my own “ribbon” trim with a tiny bias strip and bow on each little arm. I also made a wide bias hem for a peek of rainbow at the bottom of the skirt. The under collar is my favorite spot for a surprise. I used Corsage. If you, too, would like the opportunity to get your hands on one of Alison’s prints for your upcoming projects, you can enter a giveaway right here on my blog. Leave a comment telling me which print you would like to win. Alison will send you 2 1/2 yards of the print you choose. If you follow me on Instagram, you can earn a second entry. Just post that in your comment as well. The giveaway here closes on Monday, September 22, when I return from Disney World with my Ella and her cousins. 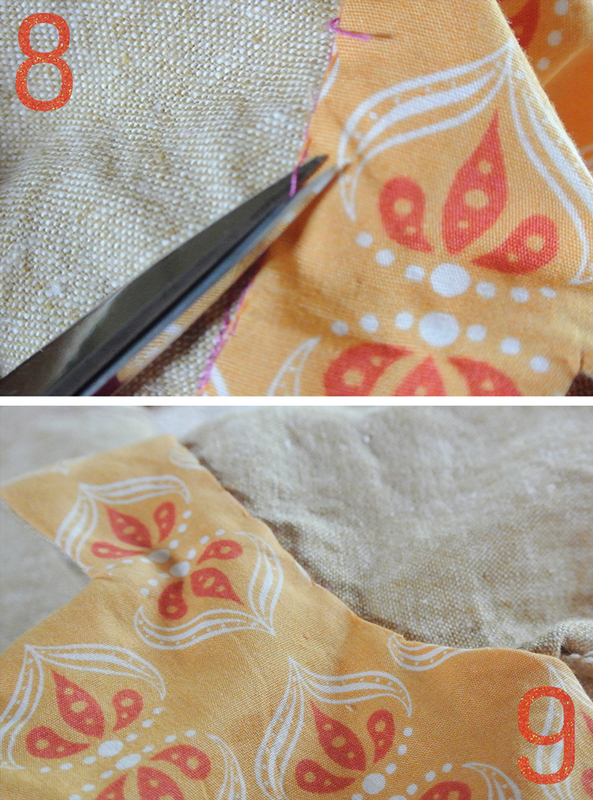 Today’s tutorial was inspired by a question I get regularly: how can I stitch a partial lining to enclose all the seams? In grown-up sized clothing it’s a little tricky to explain, but really easy to do once you know how. 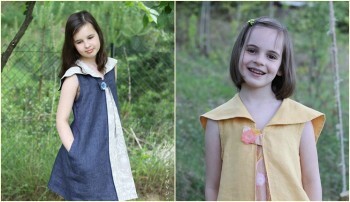 In fact, Rae put together a little video series for her Washi Dress pattern last summer. (start at 3:00 for the sleeve portion). 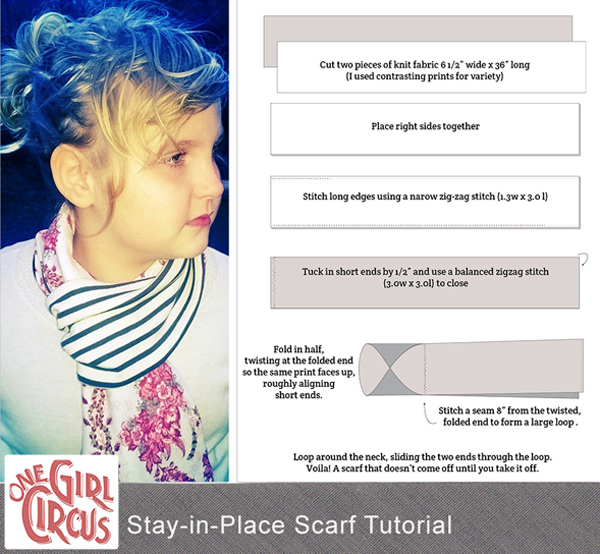 While it’s possible to use this technique with the larger sizes of little girl clothing, the process becomes trickier as the sizes get smaller. In order to accommodate the small-to-tiny size range, it’s really fast (and satisfying) to hand-stitch the lining to the sleeve and bodice seam allowances. Enclosing the seam allowances not only makes the garment more comfortable by protecting sensitive skin from seam allowances, it increases the durability of the garment, because the seams are also protected to stay strong through hundreds of wash and dry cycles. It’s how I keep my hard work from literally unraveling. The dress used in the photos is the Sally Dress from Shannon Cook, which I made in yarn-dyed Essex Linen in Leather and the Rani print from Monaluna’s Raaga collection, which I L.O.V.E. 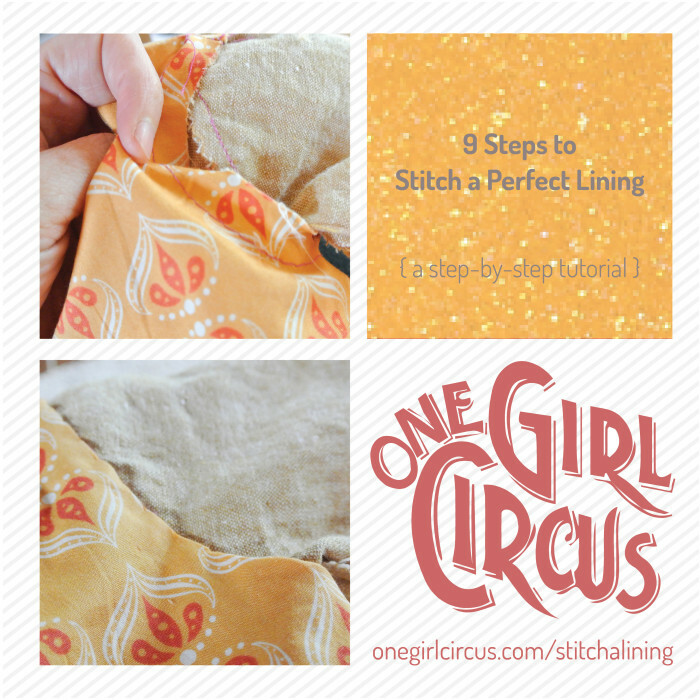 2.Clip into the lining seam allowance right up to the basting stitch. 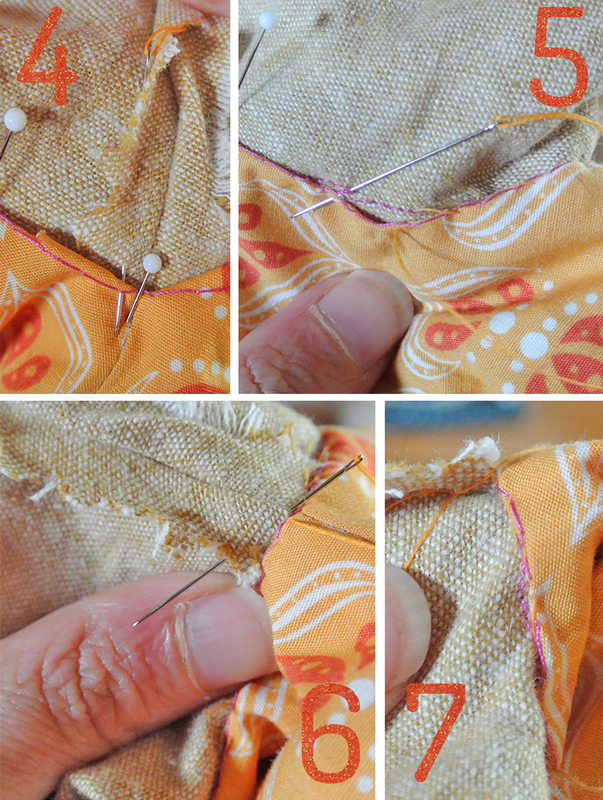 3.Fold the clipped seam allowances to the wrong side of the lining, using the stitching line as a guide. Pin in place to enclose the sleeve seam allowances. 4. Thread a needle with a single length of thread and tie a knot. 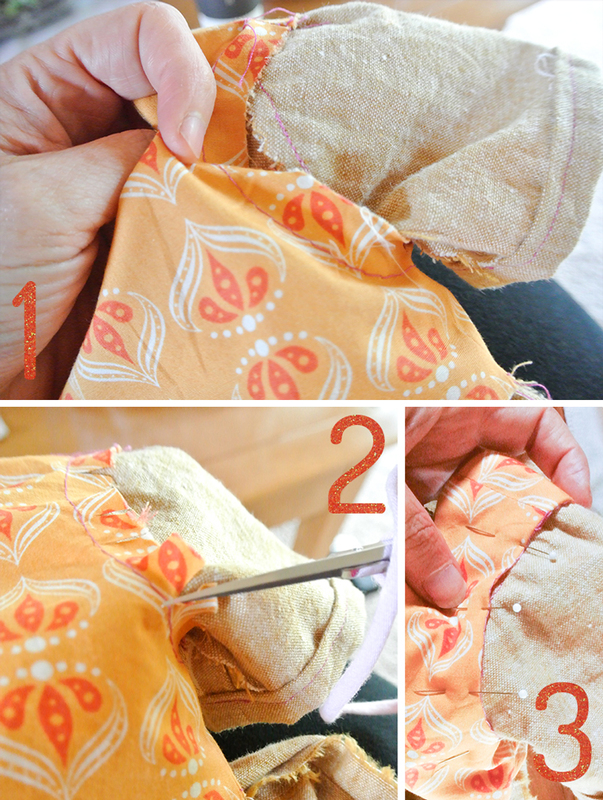 Begin your stitching by hiding the knotted end underneath the underarm sleeve seam allowances. 6. When you have sewn all around the armhole and you arrive back at the underarm seam, slide the needle underneath the seam allowance. 8. Snip the basting thread (see why I used a contrast basting thread?) and pull it out. 9. Voila! Press the seam and admire your work. Repeat for the remaining arm opening. I know a lot of sewists shun hand-stitching these days, but this tiny bit of stitching takes me less time to complete than it takes to walk downstairs and turn on my sewing machine. There’s also something about hand-stitching that connects me to the things I make; physically and sentimentally. Try this a couple times (the first time always seems more difficult – call it practice) and see if you don’t secretly enjoy it just a little. It’s time to get ready to go Back to School – can you believe it?!? 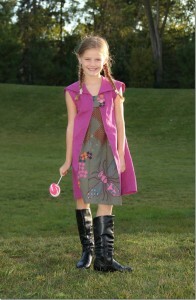 (I guess many of you are already back to school, but it’s never to late to sew up another outfit. If you’re looking for just the right outfit for your little lady to rock on her first day in a new class, check out my Goodship Dress pattern. It’s sized from 2T to 13/14 and is a perfect piece for the still-warm weather of early Autumn, or for layering with a cardigan or long-sleeved tee when the weather cools off again. Jessica added that this dress is so worth the price, you will use it over and over again! Jessica’s little girl is obviously a big fan of the pockets, too! 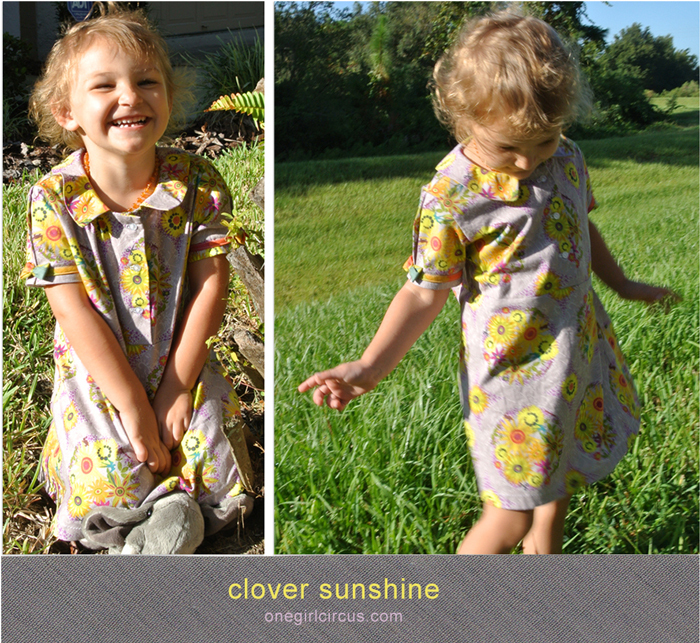 This pattern truly works for girls of all ages – just look at these dresses below. On the left, Kristy from Hopeful Threads made an adorable pink version for her young daughter, while on the right you’ll see how great the Goodship Dress looks on Kelly Hogaboom‘s older daughter. 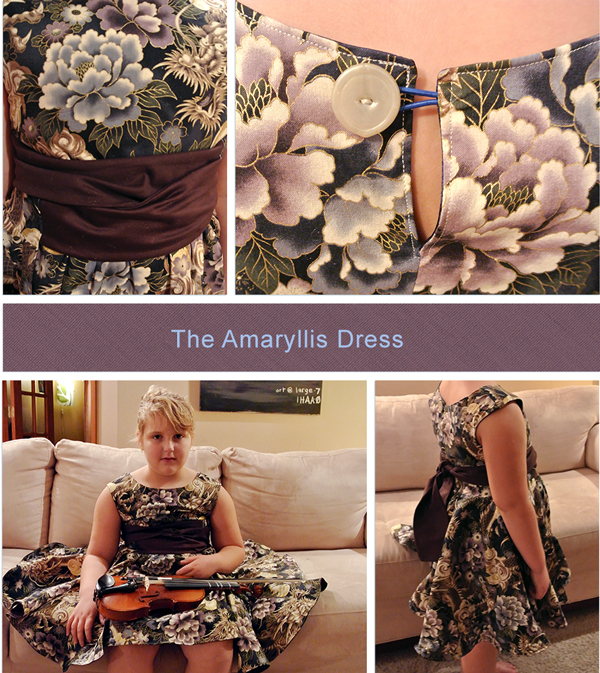 Finally, we have a gorgeous version – complete with a tutorial for adding sleeves! – from Once Upon a Sewing Machine. Just look how this dress easily transitions to the cooler months with a simple addition like that! If you’re ready to add a new wardrobe staple to your child’s closet, grab yourself a copy of the Goodship Dress and jump right in! For help along the way, visit these tutorials for sewing a blind hem, turning a crisp corner, and adding a sweet cap sleeve to any dress. Happy stitching! Isn’t it so easy to dismiss potential joys and fulfillment by caving to fear? It’s scary to look inside. It’s terrifying to imagine that I might not be who I though I was (or having never really thought about who I am in the first place). I have self-identified as so many personas; I believed these surface level labels I chose for myself to be all there is to me. 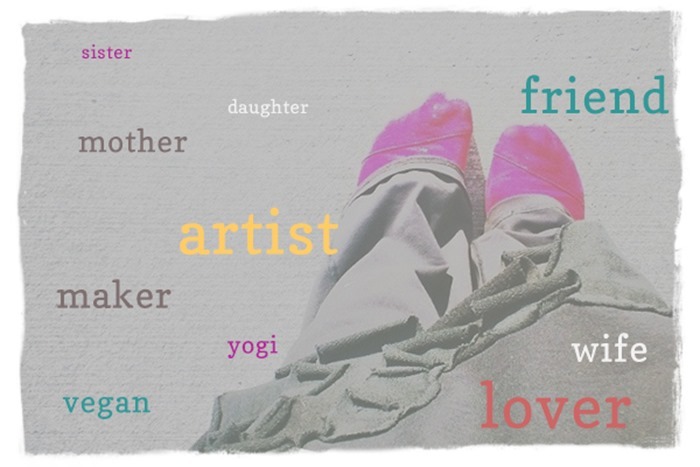 All of these and more make up the “me” I see in the mirror, but I have ignored most of all that I am a teacher. Until fairly recently (for close to 30 years now – since I started wondering who I am in the first place), not only did I ignore that I am a teacher, but I actively rallied against it internally; all the while helping, guiding, and supporting friends and strangers… you know – teaching! In high school I was an exchange student. I went to West Germany for a year (back in the olden days, before the wall came down) having only studied German for a year (why Germany and not somewhere else is another story altogether!) and when I returned , I was a fluent German Speaker. In fact, my very first J.O.B. other than restaurant work was teaching German to executives from the auto industry whose families were being relocated for work. I was 18 years old, teaching professional, degreed engineers and managers of divisions and their families to prepare for a new life that I, barely an adult myself, had lived and succeeded in doing already. When I think back on that, I am pretty impressed with myself. At the time I was riding high on accomplishment, and knew I had something to offer the world. Even then, though, that little sh*tty voice in my head would tell me “You don’t know enough of anything to teach other people” or “Why would they listen to you? You’re just a kid.” I went away to College (made a poor choice at that) and promptly ran out of courses that interested me. There was ONE German course I hadn’t tested out of placement, and after that, I would basically have had a 4-year Independent Study if I wanted to continue at that school. I changed to a French Major, studying economics as well. I was there on a music scholarship (did you even know I’m a singer?) and so continued those lessons. When I ran out of French courses to take, I switched to Japanese. Aced it. Boring. Eventually, somewhere deep inside, I realized I could teach many of the courses I was taking, considering all the tutoring I did to help pay my tuition. When working two jobs ever school break and full-time during the school year still couldn’t cover my expenses – even with student loans and financial aid, I figured it wasn’t worth my effort to finish College and quit school. I moved to California to become a singer in a rock band. (Again, an entire story in itself.) But, because I had quit school, I was now a “quitter” a loser, a slacker….pick your epithet….and those beliefs took over. When I ended up living in my car, and couldn’t survive L.A. emotionally, I came crawling back home under the condition that I was to finish school. After a few false starts at community college, I ended up at a local University – Wayne State in Detroit – and found my academic dream job after just a couple German classes. I was asked to become a research assistant for a Distinguished Professor of German in the German and Slavic Languages Department. Making 5 dollars an hour, I prepared course packs (again – literal cutting and pasting paper to other paper to photocopy) according to syllabi for the Professor’s classes, wrote footnotes for his research papers, led discussion in my language and literature courses, even sat in on Graduate Courses, and as a side job, helped his History Teacher wife grade her high school class papers. I loved every last bit of it. Naturally, I was encouraged by my colleagues to consider becoming a professor myself. I was thrilled with the research, the academic life, the pursuit of knowledge and understanding, and the application of that new knowledge to traditional topics and cross disciplinary studies. Why didn’t I pursue that course? Why did I leave school – again – to take on an administrative and marketing job for an architectural firm? Tears well up in my eyes every time I think about this, and right now is no exception: FEAR. I was terrified stiff of standing in front of a class. It didn’t matter that I had expertise in any of a number of topics. It didn’t matter that I cared deeply for my chosen course of study, or that I was passionate about sharing it with other people who exhibited even a mild interest; I was petrified of being The Teacher. I scared myself out of a fulfilling life, because no one ever told me (or perhaps I refused to notice?) that being a teacher isn’t all encompassed in knowing everything, preparing long lectures, or being “tough.” Being a teacher means lighting a spark of interest on fire in someone else. It is part leading by example and part erasing fear from the learning process. Being a teacher means it’s okay to not have all the answers, but to lead students in discovering answers for themselves. Becoming the Art Teacher for my daughter’s “school” while we functioned as a homeschool co-op (during the time we worked at becoming a charter school) taught me even more about what it means to be a teacher. Especially with something as personal as art, students need the teacher to help them feel good about what they create. I learned that I have a gift in all of my failures and fear. I can comfortably fall right down (literally or figuratively) in front of my students, whether they are younger or older than I am, and show them that it’s okay to not be perfect; that life itself is a journey of discovery and there are many paths to explore. I teach them that it’s better to not be “perfect” because where’s the fun in that? In my art classes, I always bring extra supplies so starting over isn’t painful. In my sewing classes, I offer “unsewing service.” (Hand me your seam ripper and let’s keep going) I do this because I know that moving forward is more fun than going backward. There’s no “punishment” for making mistakes, only understanding to be gained. All my life, I have been a teacher without knowing it. It took years of exploration to figure that out. What have you learned about yourself? There’s so much to discover with a little introspection! Join the Exploration Party this week, read about all the amazing explorers and share the joy!